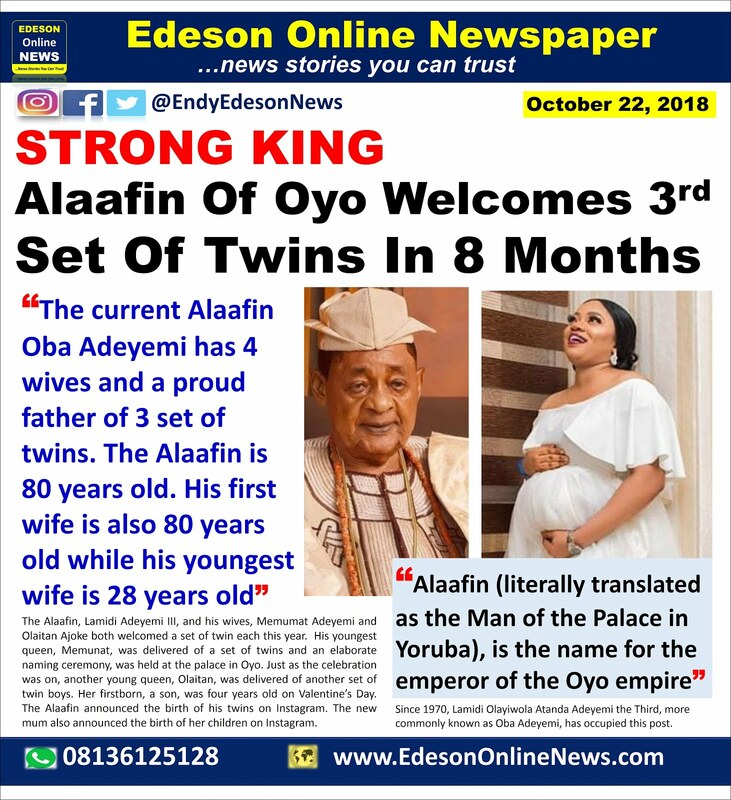 The Alaafin of Oyo, Lamidi Olayiwola Adeyemi III, has welcomed his third set of twins in 8 months with his wife Queen Aanu. 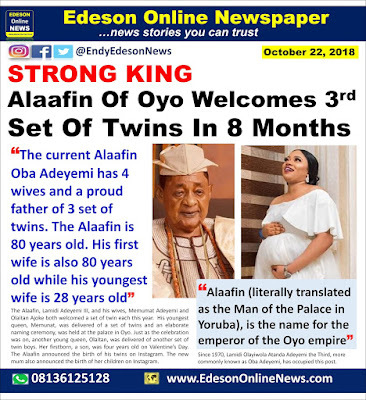 Queen Aanu who gave birth to the third set of twins the Alaafin of Oyo will be welcoming this year, gave birth to a baby boy and girl. of his twins on Instagram. The new mum also announced the birth of her children on Instagram. Alaafin (literally translated as the Man of the Palace in Yoruba), is the name for the emperor of the Oyo empire. Even though the empire now mostly exists in the history books and in Yoruba people’s hearts, it is an important traditional post. Since 1970, Lamidi Olayiwola Atanda Adeyemi the Third, more commonly known as Oba Adeyemi, has occupied this post. He was born in 1938 on October 15, which makes him 80 years old. He has four wives. He has been together with his first wife, Ayaba Abibat, for more than fifty years. Like Adeyemi, she is also 80 years old. Whereas his most recent wife is also the youngest. She is 28 years old. @Godwin; Goodevening, how many wives do you have ? Up to 4? Somehow, there's ego in impregnation multiple women. That's funny. Endy, do you know that most young men under 30 cannot "perform" without taking one concoction or the other. In fact, they are the regular customers of those selling "man power". Now that the Nigeria government is considering two children to a woman, how would these traditionalists take to this..? 80 years old man on top of 28 years old lady or wife so to speak. Na she go dey nak de Old man na. All though, her fresh blood will keep him young, that is the ritual.